These are some opening remarks for my talk on EBPM at Open Society Foundations (New York), 24th October 2016. The OSF recorded the talk, so you can listen below, externally, or by right clicking and saving. Please note that it was a lunchtime talk, so the background noises are plates and glasses. ‘Evidence based policy making’ is a good political slogan, but not a good description of the policy process. If you expect to see it, you will be disappointed. If you seek more thoughtful ways to understand and act within political systems, you need to understand five key points then decide how to respond. Should you use restrictive criteria to determine what counts as ‘evidence’ and scientific evidence? Which metaphor, evidence based or informed, describes how pragmatic you will be? The unclear meaning of ‘policy’ prompts you to consider how far you’d go to pursue EBPM, from a one-off statement of intent by a key actor, to delivery by many actors, to the sense of continuous policymaking requiring us to be always engaged. 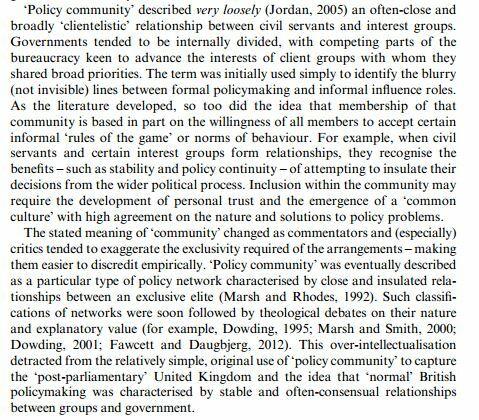 Policymaking is done by policymakers, but many are unelected and the division between policy maker/ influencer is often unclear. So, should you seek to influence policy by influencing influencers? These factors suggest that an effective engagement strategy is not straightforward: our instinct may be to influence elected policymakers at the ‘centre’ making authoritative choices, but the ‘return on investment’ is not clear. So, you need to decide how and where to engage, but it takes time to know ‘where the action is’ and with whom to form coalitions. There are several principles of ‘good’ policymaking and only one is EBPM. Others relate to the value of pragmatism and consensus building, combining science advice with public values, improving policy delivery by generating ‘ownership’ of policy among key stakeholders, and sharing responsibility with elected local policymakers. Our choice of which principle and forms of evidence to privilege are inextricably linked. For example, some forms of evidence gathering seem to require uniform models and limited local or stakeholder discretion to modify policy delivery. The classic example is a programme whose value is established using randomised control trials (RCTs). Others begin with local discretion, seeking evidence from service user and local practitioner experience. This principle seems to rule out the use of RCTs. Of course, one can try to pursue both approaches and a compromise between them, but the outcome may not satisfy advocates of either approach or help produce the evidence that they favour. These insights should prompt us to see how far we are willing, and should, go to promote the use of certain forms of evidence in policymaking. For example, if policymakers and the public are emotional decision-makers, should we seek to manipulate their thought processes by using simple stories with heroes, villains, and clear but rather simplistic morals? If policymaking systems are so complex, should we devote huge amounts of resources to make sure we’re effective? Kathryn Oliver and I also explore the implications for proponents of scientific evidence, and there is a live debate on science advice to government on the extent to which scientists should be more than ‘honest brokers’. Realistic ‘realist’ reviews: why do you need them and what might they look like? This discussion is based on my impressions so far of realist reviews and the potential for policy studies to play a role in their effectiveness. The objectives section formed one part of a recent team bid for external funding (so, I acknowledge the influence of colleagues on this discussion, but not enough to blame them personally). We didn’t get the funding, but at least I got a lengthy blog post and a dozen hits out of it. I like the idea of a ‘realistic’ review of evidence to inform policy, alongside a promising uptake in the use of ‘realist review’. The latter doesn’t mean realistic: it refers to a specific method or approach – realist evaluation, realist synthesis. The agenda of the realist review already takes us along a useful path towards policy relevance, driven partly by the idea that many policy and practice ‘interventions’ are too complex to be subject to meaningful ‘systematic review’. The latter’s aim – which we should be careful not to caricature – may be to identify something as close as possible to a general law: if you do X, the result will generally be Y, and you can be reasonably sure because the studies (such as randomised control trials) meet the ‘gold standard’ of research. The former’s aim is to focus extensively on the context in which interventions take place: if you do X, the result will be Y under these conditions. So, for example, you identify the outcome that you want, the mechanism that causes it, and the context in which the mechanism causes the outcome. Maybe you’ll even include a few more studies, not meeting the ‘gold standard’, if they meet other criteria of high quality research (I declare that I am a qualitative researcher, so you call tell who I’m rooting for). Realist reviews come increasingly with guide books and discussions on how to do them systematically. However, my impression is that when people do them, they find that there is an art to applying discretion to identify what exactly is going on. It is often difficult to identify or describe the mechanism fully (often because source reports are not clear on that point), say for sure it caused the outcome even in particular circumstances, and separate the mechanism from the context. I italicised the last point because it is super-important. I think that it is often difficult to separate mechanism from context because (a) the context is often associated with a particular country’s political system and governing arrangements, and (b) it might be better to treat governing context as another mechanism in a notional chain of causality. In other words, my impression is that realist reviews focus on the mechanism at the point of delivery; the last link in the chain in which the delivery of an intervention causes an outcome. It may be wise to also identify the governance mechanism that causes the final mechanism to work. Why would you complicate an already complicated review? I aim to complicate things then simplify them heroically at the end. Focus on ways to turn evidence into feasible political action, identifying a clear set of policy conditions and mechanisms necessary to produce intended outcomes. Produce a manageable number of simple lessons and heuristics for policymakers, practitioners, and communities. Review a wider range of evidence sources than in traditional systematic reviews, to recognise the potential trade-offs between measures of high quality and high impact evidence. Identify a complex policymaking environment in which there is a need to connect the disparate evidence on each part of the ‘causal chain’. Recognise the need to understand individual countries and their political systems in depth, to know how the same evidence will be interpreted and used very differently by actors in different contexts. There is no shortage of scientific evidence of policy problems. Yet, we lack a way to use evidence to produce politically feasible action. The ‘politics of evidence-based policymaking’ produces scientists frustrated with the gap between their evidence and a proportionate policy response, and politicians frustrated that evidence is not available in a usable form when they pay attention to a problem and need to solve it quickly. The most common responses in key fields, such as environmental and health studies, do not solve this problem. The literature on ‘barriers’ between evidence and policy recommend initiatives such as: clearer scientific messages, knowledge brokerage and academic-practitioner workshops, timely engagement in politics, scientific training for politicians, and participation to combine evidence and community engagement. This literature makes limited reference to policy theory and has two limitations. First, studies focus on reducing empirical uncertainty, not ‘framing’ issues to reduce ambiguity. Too many scientific publications go unread in the absence of a process of persuasion to influence policymaker demand for that information (particularly when more politically relevant and paywall-free evidence is available elsewhere). Second, few studies appreciate the multi-level nature of political systems or understand the strategies actors use to influence policy. This involves experience and cultural awareness to help learn: where key decisions are made, including in networks between policymakers and influential actors; the ‘rules of the game’ of networks; how to form coalitions with key actors; and, that these processes unfold over years or decades. The solution is to produce knowledge that will be used by policymakers, community leaders, and ‘street level’ actors. It requires a (23%) shift in focus from the quality of scientific evidence to (a) who is involved in policymaking and the extent to which there is a ‘delivery chain’ from national to local, and (b) how actors demand, interpret, and use evidence to make decisions. For example, simple qualitative stories with a clear moral may be more effective than highly sophisticated decision-making models or quantitative evidence presented without enough translation. We know that the world is too complex to fully comprehend, yet people need to act despite uncertainty. They rely on ‘rational’ methods to gather evidence from sources they trust, and ‘irrational’ means to draw on gut feeling, emotion, and beliefs as short cuts to action (or system 1 and 2 thinking). Scientific evidence can help reduce some uncertainty, but not tell people how to behave. Scientific information strategies can be ineffective, by expecting audiences to appreciate the detail and scale of evidence, understand the methods used to gather it, and possess the skills to interpret and act on it. The unintended consequence is that key actors fall back on familiar heuristics and pay minimal attention to inaccessible scientific information. The solution is to tailor evidence reviews to audiences: examining their practices and ways of thinking; identifying the heuristics they use; and, describing simple lessons and new heuristics and practices. Context. Identify the role of factors described routinely by policy theories as the key parts of policy environments: the actors involved in multiple policymaking venues at many levels of government; the role of informal and formal rules of each venue; networks between policymakers and influential actors; socio-economic conditions; and, the ‘paradigms’ or ways of thinking that underpin the consideration of policy problems and solutions. Mechanisms. Focus on the connection between three mechanisms: the cause of outcomes at the point of policy delivery (intervention); the cause of ‘community’ or individual ‘ownership’ of effective interventions; and, the governance arrangements that support high levels of community ownership and the effective delivery of the most effective interventions. These connections are not linear. For example, community ownership and effective interventions may develop more usefully from the ‘bottom up’, scientists may convince national but not local policymakers of the value of interventions (or vice versa), or political support for long term strategies may only be temporary or conditional on short term measures of success. Outcomes. Identify key indicators of good policy outcomes in partnership with the people you need to make policy work. Work with those audiences to identify a small number of specific positive outcomes, and synthesise the best available evidence to explain which mechanisms produce those outcomes under the conditions associated with your region of study. This narrow focus is crucial to the development of a research question, limiting analysis to the most relevant studies to produce a rigorous review in a challenging timeframe. Then, the idea from realist reviews is that you ‘test’ your hypotheses and clarify the theories that underpin this analysis. This should involve a test for political as well as technical feasibility: speak regularly with key actors i to gauge the likelihood that the mechanisms you recommend will be acted upon, and the extent to which the context of policy delivery is stable and predictable and if mechanism will work consistently under those conditions. We all talk about combining perspectives from multiple disciplines but I totally mean it, especially if it boosts the role of political scientists who can’t predict elections. For example, health or environmental scientists can identify the most effective interventions to produce good health or environmental outcomes, but not how to work with and influence key people. Policy scholars can identify how the policy process works and how to maximise the use of scientific evidence within it. Social science scholars can identify mechanisms to encourage community participation and the ownership of policies. Anthropologists can provide insights on the particular cultural practices and beliefs underpinning the ways in which people understand and act according to scientific evidence. Perhaps more importantly, interdisciplinarity provides political cover: we got the best minds in many disciplines and locked them in a room until they produced an answer. We need this cover for something I’ll call ‘informed extrapolation’ and justify with reference to pragmatism: if we do not provide well-informed analyses of the links between each mechanism, other less-informed actors will fill the gap without appreciating key aspects of causality. For example, if we identify a mechanism for the delivery of successful interventions – e.g. high levels of understanding and implementation of key procedures – there is still uncertainty: do these mechanisms develop organically through ‘bottom up’ collaboration or can they be introduced quickly from the ‘top’ to address an urgent issue? A simple heuristic for central governments could be to introduce training immediately or to resist the temptation for a quick fix. Relatively-informed analysis, to recommend one of those choices, may only be used if we can back it up with interdisciplinary weight and produce recommendations that are unequivocal (although, again, other approaches are available). We need to understand individual countries or regions – their political systems, communities, and cultural practices – and specific issues in depth, to know how abstract mechanisms work in concrete contexts, and how the same evidence will be interpreted and used differently by actors in those contexts. We need to avoid politically insensitive approaches based on the assumption that a policy that works in countries like (say) the UK will work in countries that are not (say) the UK, and/ or that actors in each country will understand policy problems in the same way. It all looks incredibly complicated, doesn’t it? There’s no time to do all that, is there? It will end up as a bit of a too-rushed jumble of high-and-low quality evidence and advice, won’t it? My argument is that these problems are actually virtues because they provide more insight into how busy policymakers will gather and use evidence. Most policymakers will not know how to do a systematic review or understand why you are so attached to them. Maybe you’ll impress them enough to get them to trust your evidence, but have you put yourself into a position to know what they’ll do with it? Have you thought about the connection between the evidence you’ve gathered, what people need to do, who needs to do it, and who you need to speak to about getting them to do it? Maybe you don’t have to, if you want to be no more than a ‘neutral scientist’ or ‘honest broker’ – but you do if you want to give science advice to policymakers that policymakers can use.